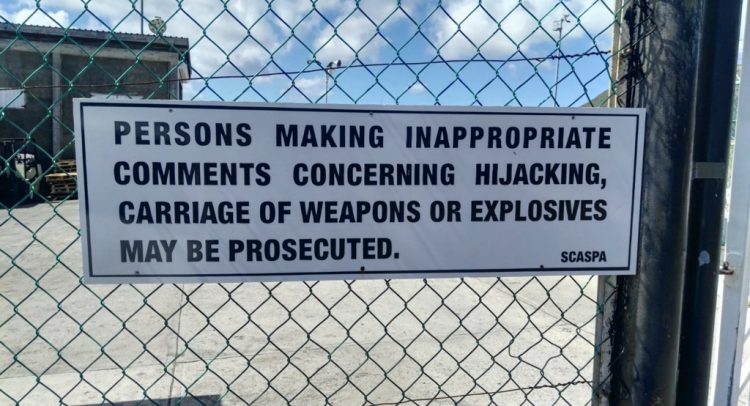 Basseterre, St. Kitts, February 01, 2019 (SKNIS): Most travellers are familiar with security regulations at airports governing access to sensitive areas, screening practices, and the limitations on fluid ounces that are allowed onboard aircrafts. However, there are rules about specific spoken words that can create suspicion of danger in people’s minds. “Sometimes, I tell passengers and people that if you see a friend and his name is Jack, be very careful to [not] say ‘Hi Jack’ at the airport,” said Royston Griffin, Senior Civil Aviation Officer at the Ministry of Aviation in St. Kitts. Joking around at the airport with language that can be interpreted to be a threat of a possible hijacking can create alarm at the airport. “Especially in today’s world when we have social media,” Mr. Griffin warned, noting that information and misinformation often referred to as fake news, can spread very quickly. “Because of the [attack] on 9-11 there is still fear within people and because of that there are rules at the airport and signs which state what you can’t say in terms of bombs, and hijack, and all these things,” the senior civil aviation officer noted. Upon conviction, persons can be fined a minimum of $2,000 up to $50,000 or face imprisonment. Mr. Griffin encouraged persons to make an effort to learn about the rules, security guidelines and safety procedures at ports of entry and exit. Most of these are in line with standards established by the International Civil Aviation Organization (ICAO). According to its official website www.icao.int, ICAO works with 192 Member States and industry groups to reach consensus on international civil aviation Standards and Recommended Practices (SARPs) and policies in support of a safe, efficient, secure, economically sustainable and environmentally responsible civil aviation sector.